Seven nursery-age children dashed about the house. I had offered to look after my daughter’s friends so their parents could spend the afternoon doing Christmas shopping. What could go wrong? Apart from expected mayhem. To calm things down, Carol, my daughter, suggested they form a circle. I watched as they sat, legs crossed, eager for the next thing to happen, a story perhaps? ‘So,’ began Carol, ‘does anyone believe in Father Christmas? Put up your hand if you do.’ Harry, the youngest, raised his arm then let it fall. This actually happened. Names have been changed to protect the innocent. 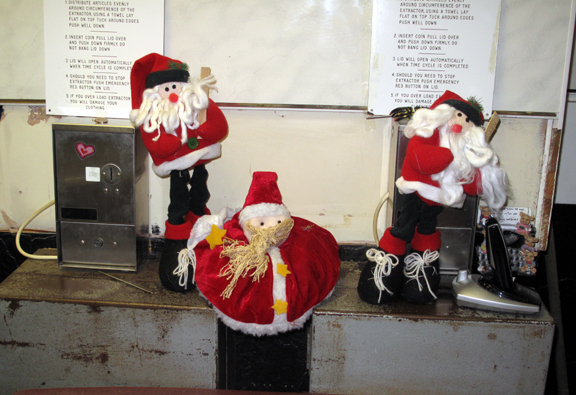 The Christmas iconography was photographed at the local launderette. This entry was posted in Peckham, Photography, Writing and tagged Christmas story, disillusionment, Father Christmas, launderette, photography. Bookmark the permalink.